I'm not sure if this is the right place to ask this.... I'm moving to Tokyo in january. I got an iPhone 5S in Canada. I need a simple voice plan with unlimited data and LTE if at all possible.... What's the best way to accomplish this? Probably it's the same problem as the data-only SIMs not showing the signal bars due to missing components. Just a guess. Sell it and get something new when you get here. I was considering that, problem is that if I ever decide to come back to North America, my phone will be useless. I hear it's almost impossible to get a Japanese iPhone unlocked. Swap your iPhone for a Nexus5 - international version. I need some apps that are iPhone only, which restricts me to iPhone. The 5S seems to works on most bands internationally. I just need to figure out how to get connected without signing a 2 year contract, have limited data or ending up with an iPhone that'll only work in Japan. Will you get a residency card? If so, can use Docomo plan with your own iPhone (if the canadian version LTE band is the same) and you can get voice and data (LTE). There are no unlimited data plans, at least with full speed LTE the whole way. You'll get at most 7GB and then it'll throttle to 2G speeds. If you want to keep your phone (if it's unlocked, it's pretty valuable), then you'll have to use one of the bmobile sims. And then you'll have the restrictions you see above. If you can't live with those restrictions, I suggest you keep your unlocked device and get a new one when you get here. You'll have to pay for it anyways. Well, you are certainly right on unlimited data, but he could get the ala carte Xi SIM (linked at the top of this page) straight from Docomo. The only problem would be if the phone doesn't have the giteki (certification) mark. And that is more hit or miss, at least it was in the past. It's my understanding that there is a "certification" section in the iPhone settings, and it displays on the screen the different agency marks. If it shows the MIC mark, then no problem. The certification mark is one thing, network access another issue as Jon would like to use LTE. 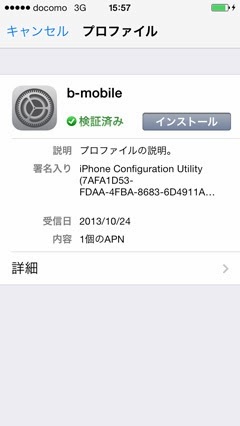 Some Japanese blogs report that some overseas iPhones can connect through the sp-mode APN, while others don't work as this APN is still IMEI-filtered. The problem is that the Docomo shop clerks won't be able to tell you whether it works as they probably also do not know the technical background (and certainly not the IMEI whitelisting rules). Certification logos are displayed by country and the shops usually check this when signing up. Yeah, I think that the docomo people aren't so concerned that it's certified for Japanese networks officially--just that it may be IMEI filtered and won't work and they don't want you to sign up for a contract and they won't be able to do anything about it once you do. Well they didn't go directly from PHS to 3g. I had phones which were neither. Like for example in DoCoMo, before FOMA (3g) there was MOVA (2g). Also, I remember clearly that 090 numbers were used before 080 numbers for mobile phones (Wikipedia tells me that 090 numbers were used from 1999, and 080 numbers from 2002). MOVA used 090 numbers. You're absolutely right; I completely forgot about mova. Which is odd, because I used to own one in the mid nineties. Although, it should be pointed out that the Docomo mova brand name was used to refer to both first generation analog cell phones as well as PDC digital (and their were a few hybrid units that did both). Docomo ended their mova service at the same time they ended analog NTSC TV: March 31, 2012. Sorry if this is the wrong place to post this! I've spent quite some time searching for a nano-sim card that will work with my unlocked iPhone 5S from Hong Kong. I want to buy the b-mobile スマート SIM from Amazon or b-mobile with 2GB per month of data only. But it seems they do not sell nano sims for those plans. If I want that price plan is my only option to buy a micro-sim card and cut it to nano size? Or does anyone have another recommendation for someone like me who just wants a couple of GB data for an unlocked iPhone 5S? Many thanks in advance! Thanks for all your help, folks! I believe I'll have a gaijin card. I'll likely just sell my iPhone in Canada, sign up for an iPhone 5S contract in Japan, then buy a cheap unlocked android phone to use when traveling. Seems to be the best way to get the most bang-for-buck from the Japanese carriers. From what I've found, the pay-as-you-go plans are much more expensive than a normal voice/data plan on contract due to the discount. So, if I'd be paying more for a plan just to have service outside of a contract than it'd be more economical to just pay the cheaper rate and get a free phone out of it too. Also, in Canada our contracts are 3 years so a 2 year contract would be a treat. I think your best option would be just to cut the card. There are several kits you can find on ebay that'll help you cut it precisely, or you can just use scissors. The only thing to keep in mind is that you'll probably have to use sandpaper in order to file down one side of the card as the microSIM and nanoSIM are not the same thickness. Thanks Jon! Good to have confirmation that, that's the best choice at the moment. Following you advice, I found this guide. So I'll probably follow it and hope for the best. I thought PHS technically does not count as mobile phones as it actually works like coreless phone. Thanks Jon! Really appreciate the advice. I think that's what I might do. I thought I might ask a follow-up question, if it's okay. A friend mentioned another company (ONC) that do sell nano-sim cards and at lower prices per month that b-mobile for the same amount of data. But I can't find any information about how good their data speeds are in practice. This card does seem to have quite a large number of positive reviews though. Anyone here used ONC before? Update: After spending a few agonising hours, I managed to find a work-around: 1) disable the LTE option (this seemed to be what was making me loose network connection and didn't make much sense anyways since I'm on a 3G plan...) and 2) since I'd lost my ability to manually set the APN settings, create a profile for APN carrier settings using one of the websites available for that sort of thing. Finally one question: I'm assuming that it's not possible to access the LTE network (with an LTE SIM from b-mobile) from a non-Docomo iPhone because of the IMEI filtering, but would be grateful to hear about it if someone has had success with this? Hi there Peter, thanks for letting us know about that. I hope you can get it working again soon. I hope b-mobile will try and work on a fix because most people will update to the latest version without thinking about it. Ah that's good news. I think I'm going to go ahead and order the OCN sim I linked to above. I'll let you guys know if I can get LTE working with it or not. But honestly, I'll be happy with a working 3G connection. Hey Paul, let me know how your experience with OCN is. I have a Nexus 5 and am considering purchasing a 2GB SIM from OCN. Thanks! No problem, Alan. I've just ordered it from Amazon and should be able to test it over the coming weekend. Will report back with my findings! Unfortunately I have no experience with OCN. Although, it does seem to be a good option if you can get a proper sized SIM and are able to get connected, at a reasonable price, without a contract. Please let us know know it works out. Does this mean I'm now able to use LTE on my unlocked iPhone 5 A1429? I bought the b-mobile Smartphone LTE nanoSIM two months ago from Yodoyabashi but have never been able to get LTE in the last two months, on any APN settings. Even what usually would be the "Enable LTE" setting under Cellular Data Network shows "Enable 3G" for me. What could be the problem? I've forgone free minutes for LTE and am stuck on 3G instead. Some help would be appreciated. Thanks! Hey guys, okay I have 3G working now with this OCN nano sim ( http://www.amazon.co.jp/NTTコミュニケーションズ-OCN-モバイル-ナノSIMパッケージ-T0003818/dp/B00EQ12CPU/ref=pd_cp_e_0 ) on my iPhone 5S (bought from Expansys http://www.expansys.jp/apple-iphone-5s-a1530-unlocked-64gb-silver-253341/ ). After eventually getting the card activated with OCN (had to call them as my credit card was refused to start with) I had to alter the APN settings manually using the Apple Configuration Utility ( http://support.apple.com/kb/DL1465 ) with these settings ( http://www.unlockit.co.nz/mobilesettings/settings.php?id=894 ) and my user name and password that OCN sent me in the mail. I'm not sure how to test LTE, so if anyone has any suggestions for how I can alter the APN settings to check that I would be very happy to try! Also, the original cellular 2G/3G phone numbers in Japan were 090 numbers. 080 came later when 090 numbers started to get a bit scarce. I've been back in JP for a few weeks now, and I've had no problems getting LTE on my iPhone 5s (european model) using a BIGLOBE data-only sim. Perhaps the LTE issues on data-only SIMs have been resolved? Today I also got BIGLOBE's new SMS SIM, which finally gets the signal strength meter working! Same mechanism as the voice plans I guess, but their SMS plan doesn't require proof of residency, same as with a data-only SIM.